Privacy glass is ideal for a making a high-traffic bathroom more functional. While clear glass is favored for master bath shower enclosures, frosted glass is preferable for a guest bath or restroom shared by siblings. Acid is applied to glass to etch its surface and leave it “frosty.” This frosted glass offers more privacy than alternatives such as patterned or tinted glazing. Moreover, this glass features a timeless and classic look that can coordinate with many types of décor. So whether the bathroom in question is modern, transitional, or traditional, a frosted glass shower door will be able to fit in harmoniously while adding clean lines and subtle elegance. What are the benefits of a frosted glass shower? With a shower encased in clear glass, one child can brush her teeth while her sister showers or one boy can comb his hair while his brother showers, thus making the space more practical for siblings trying to get ready for school at the same time. Guest bathrooms also see multiple users at times, especially when relatives stay at your house for a local wedding or family reunion. Again, privacy glass on the shower stall makes the space more functional and user-friendly. Are there other ways frosted glass can improve a bathroom? 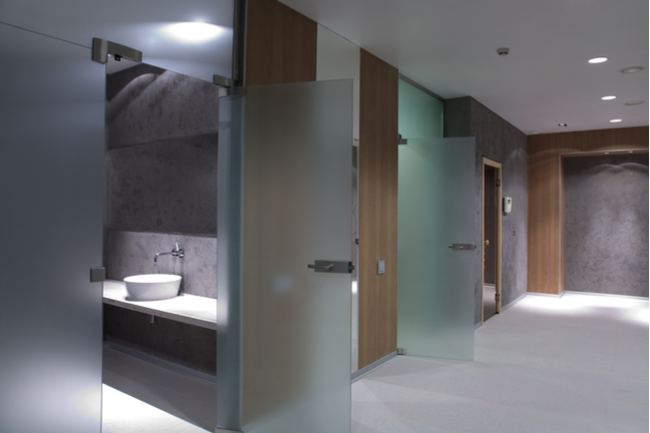 Frosted glass can also be used to add privacy to the toilet area, further boosting the room’s functionality for multiple users. A screen or half-wall made of frosted glass can be installed to partition off part of the bathroom. This secluded “water closet” not only gives privacy to the person using the toilet, but even brings the bathroom into sync with today’s interior design fashions that favor blocking the commode from sight. Can frosted glass be used on bathroom windows? Absolutely! Ordering a frosted replacement unit for your bathroom window allows you to enjoy the benefits of natural light without worrying about privacy issues. Understand that you probably don’t need to replace the whole window to achieve this. Rather, glaziers can remove select panes and replace them with the appropriate panels of frosted glass. Replacement glass options typically even include energy-friendly upgrade options such as multiple panes and argon gas. Are there any other ways to utilize frosted glass in a bathroom? Last but not least, frosted glass shelves can be added to your bathroom to complete the look and make it more organized and visually appealing. This shelving will tie in with the bathroom’s other privacy glass, and it will allow you to more easily keep the bathroom neat and tidy. Open shelving is the perfect storage solution for frequently used bathroom items such as bath towels and even toilet paper!